OFFICE LOCATED IN TECH PARK SOUTH OFF OF DAVE LYLE BOULEVARD TURN INTO THE STREET AT THE CIVITAS STATUES. TURN RIGHT AT THE STOP SIGN; THE BUILDING WILL BE TO YOUR RIGHT. WE CAN HANDLE MANY OF YOUR NEEDS ONLINE AT WWW.SSA.GOV/ONLINESERVICES OR BY CALLING 1-800-772-1213 TO USE OUR AUTOMATED SERVICES. The Rock Hill Social Security office is located in Rock Hill 29730. The following page includes information for this location like the office phone number, hours of operation and driving directions. If you have any interests or comments about your retirement benefits or are interested in making an appointment, call the following Rock Hill Social Security office. The Rock Hill Social Security office is located at 499 Lakeshore Pkwy. 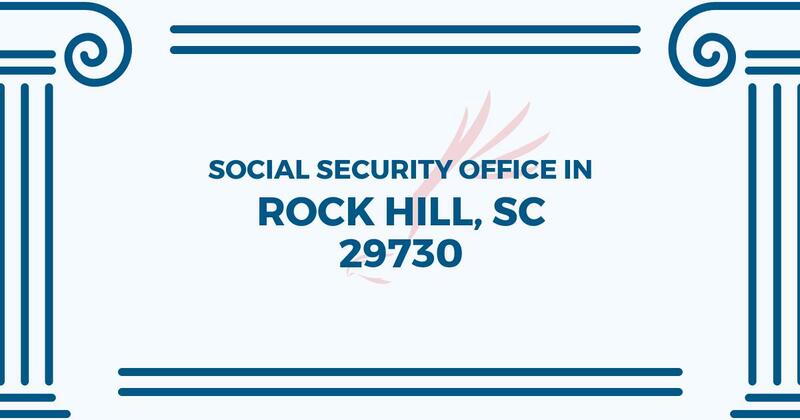 The Rock Hill office offers information, assistance and services handled by the Social Security Administration. The following page provides information for this location like the office phone number, hours of operation and driving directions. If you have requests or comments about your retirement Social Security benefits, or you need to schedule an appointment, contact the Rock Hill Social Security office.